Hydropower | Obermeyer Hydro, Inc. The 1 to 3 foot margins typically required to cause failure of flashboards cause unnecessary upstream flooding under high flow conditions. 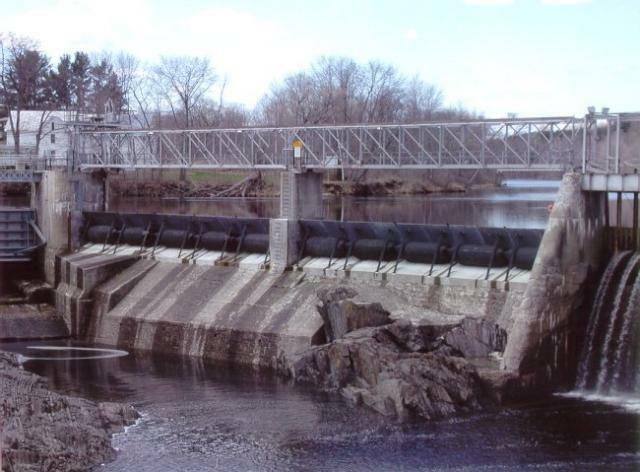 Obermeyer Spillway Gates accurately maintain the optimum pond level for increased power generation while eliminating unnecessary upstream flooding. Unlike flashboards, Obermeyer Spillway Gates can be raised immediately as flows recede. This results in greatly increased power production when high flows are available and high tailwater elevations would otherwise reduce power production. Obermeyer Spillway Gates allow spillway flows to be directed in the most beneficial manner. 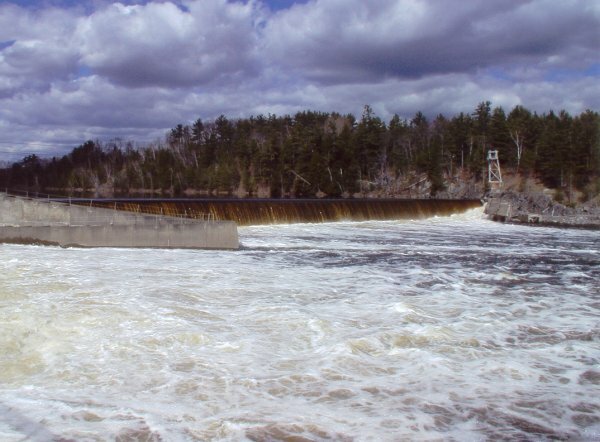 At many facilities, power plant tailwater elevations may be minimized, and power output increased, by directing spillway flows away from the power plant. By using independently controlled sections of Obermeyer Spillway Gate this can be easily accomplished. Flows may be directed to provide attraction water for fish ladders, and debris and ice may be passed over the spillway in such a way that power generation facilities are not adversely affected. The controlled pond level provided by the Obermeyer Spillway Gate System allows formation of stable ice cover, thus reducing the formation of fragile ice that otherwise obstructs the intake trash screen. Low head hydropower plants benefit both from the greater head provided by Obermeyer gates and from the greater turbine flow rate resulting from the greater head provided. Significant increases in annual generation may be achieved by the installation of Obermeyer spillway gates at low head hydropower plants. High head hydropower plants also benefit from the utilization of Obermeyer spillway gates. The impounded head pond behind Obermeyer spillway gates acts as a settling basin. The automatic controlled lowering of Obermeyer Spillway Gates during flood events prevents upstream flooding and allows the impoundment to be periodically cleared of sediment which would otherwise pass through the hydropower plant shortening turbine life.